A year to the day after Donald Trump’s election ignited a culture of protest in Seattle, tens of thousands of people took to the streets Saturday to renew their commitment to resist Trump’s presidency and to work toward what they see as a more just and inclusive society. 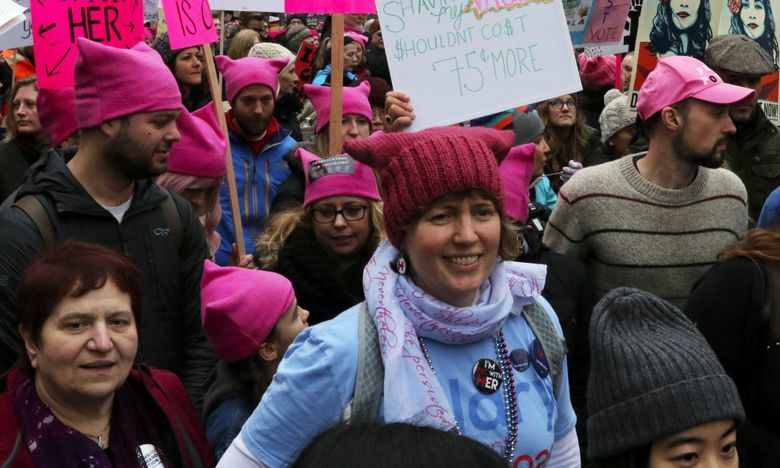 Sunshine Pegues of Seattle, who gave her age as “over 60,” marched in a pink pussyhat and a neon pink Women’s March hoodie to declare that she would not abide a rollback of civil rights in America under the Trump administration. Others declared their support for environmental protection, LGBTQ and immigrant rights, criminal justice and police reform, protection of women from violence, and other social-justice causes. As in other cities, the president’s tweet — calling Saturday a perfect day for women to “celebrate the historic milestones and unprecedented economic success and wealth creation that has taken place over the last 12 months” — amounted to a complete disconnect. No official crowd estimate in Seattle was made, but police put the number of marchers in the tens of thousands. Largely white, female and middle-aged, they formed a continuous exuberant stream along the 2-mile route that stretched from Cal Anderson Park on Capitol Hill to Seattle Center. In Olympia, about 8,000 people gathered at the steps of the Capitol for a rally version of the women’s march. 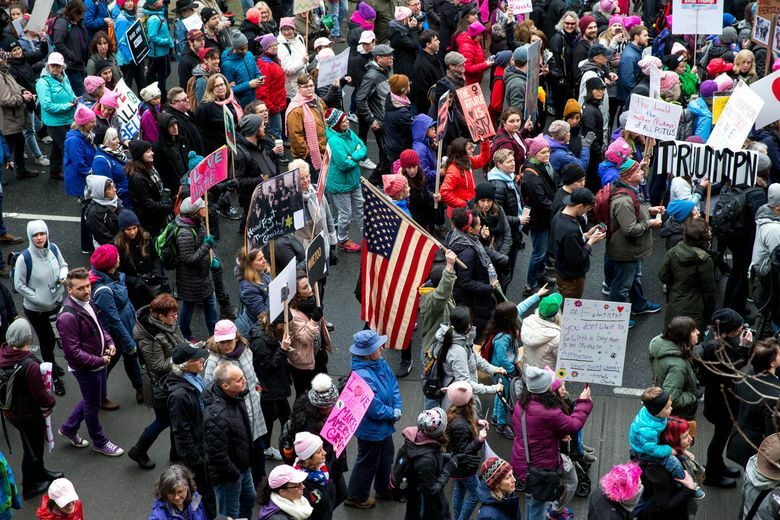 Last year’s Womxn’s March on Seattle, held the day after Trump was inaugurated, drew more than 100,000 protesters, the largest number in the city’s history. Across the nation and the world, millions marched. 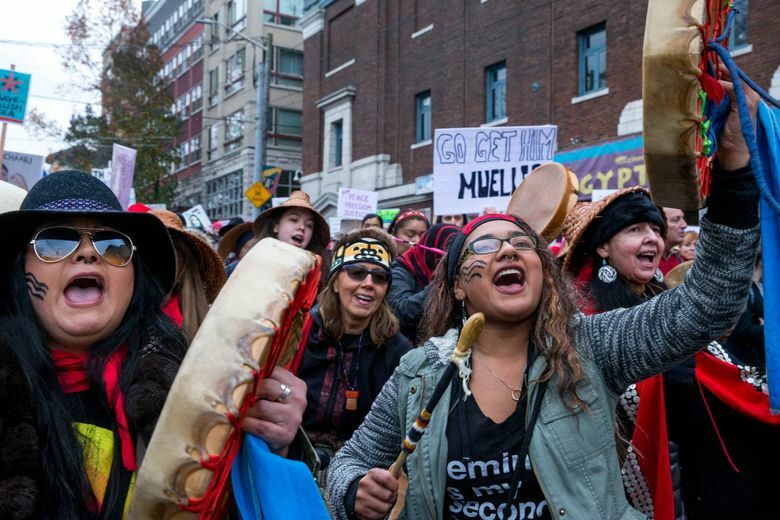 Saturday’s event — one of hundreds across the country — began with a rally, where missing and murdered indigenous women were named and honored, along with their families, and where local politicians spoke to a new activism that has taken root in the year since Trump took office. Teresa Mosqueda, a former labor leader who was elected to the Seattle City Council in November, credited those in the crowd for helping to change the makeup of local government. “We now have a majority people of color and a supermajority women council, and that is because of our movement,” she said as a light rain fell. Mayor Jenny Durkan, wearing a black T-shirt printed with the words “Fight like a girl” printed in pink slammed the Trump administration’s threat to arrest leaders of sanctuary cities, including Seattle, that limit local government involvement in immigration enforcement. This year, organizers put as much emphasis on activism as marching. A day of events on Sunday, titled Womxn Act on Seattle, will round out the weekend with training, workshops and lectures offered by about 90 organizations around the city. 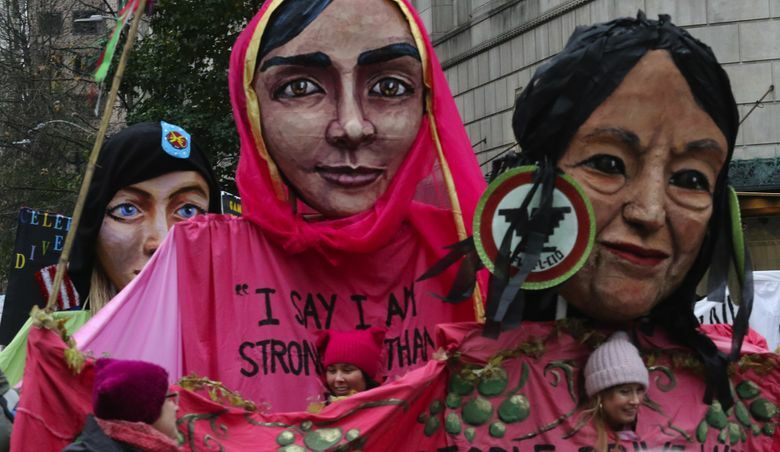 In interviews, marchers talked Saturday about how difficult the last year has been for them, and about their rising political awareness and activism in the face of a president who has demonstrated a pattern of racist behavior, withdrawn from an international climate accord, and staffed federal agencies with people antagonistic to science and women’s rights, among other things. “It’s been really hard, heavy; heavy is the right word,” Millie Lasky, 18, a student at the University of Puget Sound, said of the last year. She’d come to the march with about a dozen classmates, all of whom swore they’d be voting in November, many for the first time. She’s most concerned about attacks on birth-control access and abortion rights. “It’s angering that they think they can take them from us,” Jorgensen said. Lynne Giffin, 64, drove to the march from her home in Bonney Lake, east of Tacoma. A CT-scan technologist, Giffin said she voted regularly but wasn’t politically active until Trump’s election. She’s since canvassed for a local Democratic candidate, donated to Democratic candidates in three other states, and is now focused on helping Democrats capture the congressional seat being vacated by U.S. Rep. Dave Reichert, R-Auburn. “We have to get out the vote,” Giffin said. Antoinette Smith, 45, of Redmond, voted for the first time in 2016. Frustration with what she described as “a lot of backward movement,” prompted her to vote in local elections this fall, and attend five political rallies. 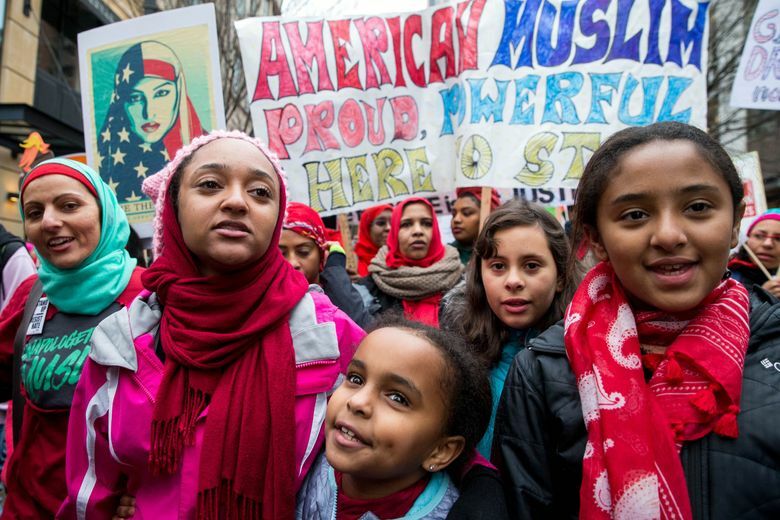 While the march was overwhelmingly anti-Trump, not everybody marched for that reason. Dave Hoyopatubbi, 61, of Seattle, said he was marching to honor missing and murdered indigenous women. For Hoyopatubbi, a member of the Choctaw Nation of Oklahoma, the march wasn’t about Trump. “God put him in place for a reason, maybe we don’t know what that reason is yet,” he said. Blake Shelafoe, the grandson of Duwamish tribal chairwoman Cecile Hansen, speaks to the Missing and Murdered Indigenous Women’s group before they lead the Seattle Women’s March, Saturday January 20, 2018. 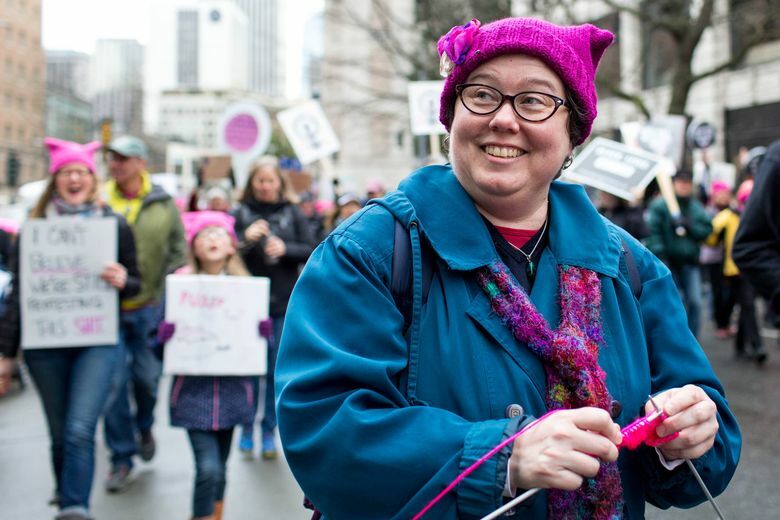 Emily Randall, a health-care advocate from Bremerton who is running for the 26th District state Senate seat, credited last year’s Womxn’s March with motivating women to run for office. 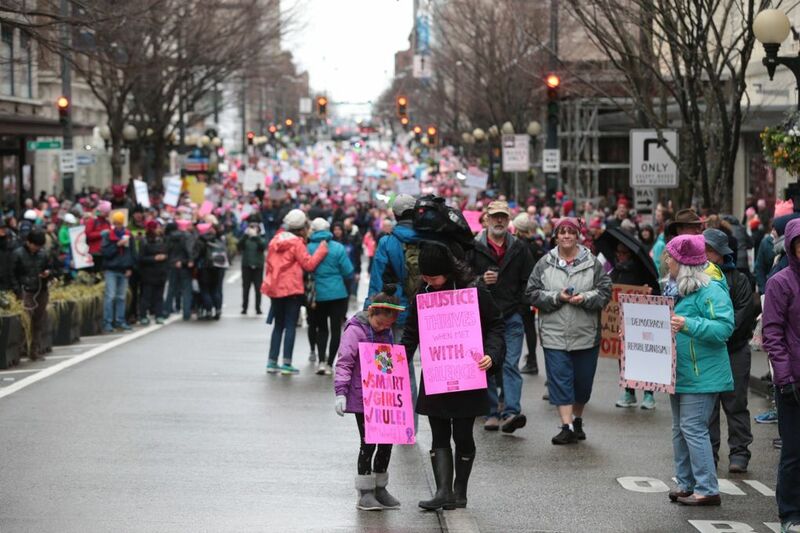 She’s been active in the Women’s March Kitsap Huddle, a group formed for political organizing after last year’s march. Jada Brazil, 37, said she was heartened to notice there were more people of color and more men than at last year’s march. One organizer, Janinne Brunyee, said the goal of the march was to create a safe space for anyone to voice whatever issue is important to them, and organizers were pleased with the results. “Get involved — that’s really what we want people to take away from today,” Brunyee said.